In the present paper an overview of the basic ingredients of group psychotherapy for psychosis is attempted. To this end, the usefulness of group psychotherapy as an adjunctive form of treatment for psychosis is highlighted, together with the challenges and difficulties that this form of therapy can entail. Also, a brief presentation of the common elements that various forms of group psychotherapy may share across therapeutic approaches is attempted, alongside with common therapeutic factors, therapists’ roles, as well as issues of transference and countertransference. Additionally, group psychotherapeutic modalities based on the cognitive-behavioral and psychodynamic approaches are outlined together with research evidence for their outcome effectiveness. Finally, the possibility for the integration of elements from these two psychotherapeutic approaches is discussed. Group psychotherapy as an adjunctive therapeutic modality for psychosis has a long tradition of more than 90 years (Aiello & Ahmad, 2014; Caruso et al., 2013; Kanas, 1985). From the initial attempts of Lazell in utilizing group techniques for the treatment of dementia praecox dated as back as in 1920 (Lazell, 1930), to the relevantly recent deinstitutionalization – mainly after 1970 - of patients from long term treatments in psychiatric hospitals to the care of short-term treatments in psychiatric departments of hospital settings as well as to rehabilitation day centers, interventions provided in a group format have been placed among the necessary provided treatments for people suffering from psychosis, further showing positive outcomes (Orfanos, Banks, & Priebe, 2015). From this accumulated experience of the use of group therapy for psychosis, it has been evident that psychotherapeutic modalities based on a group format can consist of a powerful agent of change for psychotically disturbed patients, as group interventions can produce the common therapeutic factors interwoven with group dynamics and interactions (Restek-Petrović et al., 2014; Yalom, & Leszcz, 2005), as well as more specific experiences and factors associated with the peculiarities of this population (Caruso et al., 2014; de Chávez, Guttierrez, Ducaju, & Fraile, 2000; García-Cabeza, Ducajú, Chapela, & de Chávez, 2011). However, apart from the specific mechanisms of therapeutic change associated with the provision of interventions in a group format, group therapy for people suffering from psychosis can have several clinical advantages and benefits for these people, further justifying its importance in the therapy of psychosis. Psychotherapeutic interventions delivered in a group format can be more cost-effective given that in the context of a group one or two therapists can provide therapeutic interventions to several people at the same time (Kahn & Kahn, 1992; Mc Quaid, 2008). Also, given that people who suffer from psychosis also suffer from poor interpersonal relationships and social contacts, often facing social isolation (for example see Macdonald, Hayes, & Baglioni, 2000), group therapy may offer a context for the building of social relationships, can provide social feedback, as well as a context for sharing information and for interpersonal and observational learning, facilitating in turn the development of social and friendly relationships fighting the social exclusion and stigma that these people face (Kopelowicz, Liberman, & Zarate, 2006; McQuaid, 2008). On the other hand, the specific features characterizing the very nature of psychosis place certain challenges for delivering psychotherapeutic interventions in a group format, as compared with respective group therapy modalities for neurotic of less disturbed patients (Smith, 1999). The existence of positive psychotic symptoms (e.g. hallucinations, delusions) and/or negative ones (e.g. avolition, anhedonia, diminished emotional expression, asociality) may place heavy obstacles in the group treatment, as well as heavily influence the way that group therapy is conducted, its content and processes, duration, members’ selection, etc.. For example, persecutory or paranoid delusions may hinder the trust among group members, hallucinations may lead to perceptual distortions, while the existence of negative symptoms among group members appear to be even more challenging as these generally are more resistant to medication, are positively associated with lower social functioning and quality of life, and can overall place a great barrier in the group cohesion, in the development of social relationships and in the formation of emotional bonding among group members (Buckley, & Stahl, 2007; Hunter & Barry, 2012; McQuaid, 2008; Wykes, Parr, & Landau, 1999). Alongside with the existence of the psychotic symptoms, the parallel existence of a possibly high degree of cognitive impairment may also characterize psychotically disturbed individuals, further contributing to the difficulties and peculiarities that group therapy for psychosis may entail. Finally, secondary difficulties deriving from psychotic symptoms, such as high rates of substance abuse (e.g. cannabis, tobacco, alcohol), poor financial resources, and heavily impaired social, interpersonal, and vocational functioning, may all negatively interfere with the process and content of group interventions for this population (McQuaid, 2008). In the section that follows a brief presentation of the common elements that group psychotherapeutic interventions may share based on the aforementioned challenges, as well as a depiction of the therapeutic factors that operate in such group interventions is attempted. Group therapy for psychosis can be implemented both for inpatient groups in hospitals’ psychiatric wards settings, as well as in outpatient settings such as community-based day-care and rehabilitation centers (Caruso et al., 2013; Kanas, 1985; Orfanos et al., 2015). In either case, the central scope of group interventions for psychosis is the development and facilitation of adaptive coping strategies and of a better understanding and self-awareness for people suffering from psychosis via the utilization of the group context, dynamics, group mirroring, and group therapeutic factors (de Chávez, 2009). Inpatient group sizes may vary from 5 to 12 members, with 4 to 8 patients to be more preferable as larger groups may face issues with group cohesiveness, or may become chaotic, particularly when group members consist of patients in the acute psychotic phase (Kanas, 1985). Sessions can be held from three to five times per week, while each session may last from 45 to 60 minutes. On the other hand, outpatient groups can be larger in terms of the number of members participating as these can reach up to 15. Sessions are usually held at a weekly basis, while their duration may vary from 60 to 90 minutes (Kanas, 1985; Aiello & Ahmad, 2014). Inpatient groups tend to be short-termed, from less than a month (Gabrovsek, 2009) up to six month (Lorentzen & Ruud, 2014), while outpatient groups are usually more long-term oriented, from 1 year (Lorentzen & Ruud, 2014) to several years of duration (Aiello & Ahmad, 2014). In both inpatient and outpatient settings groups can be open to new members, with higher rates of members’ mobility (new patients entering and old patients leaving group) to be observed in the case of inpatient group settings (Kanas, 1985). Finally, in terms of members’ diagnostic homogeneity, it appears that in inpatient settings a relevantly higher degree of heterogeneity among patients-members’ diagnostic categories may exist, although it is suggested that it is more preferable in terms of group cohesiveness and of meeting the needs of the patients, psychotherapeutic groups to be homogenous in the case of psychosis (Kanas, 1991). The formation of the groups can vary depending on the setting. 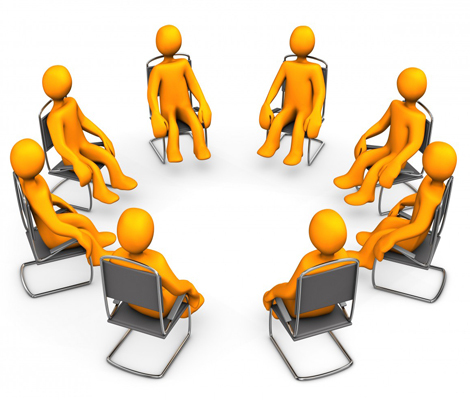 In inpatients settings group formation may be based on potential members’ level of functioning (e.g. high level of functioning with members although being psychotic presenting however good social and cognitive function with limited signs of disorganization, as opposed to low level of functioning manifested by patients being heavily regressed and disorganized) or groups can be formed on a team-based approach with new patients to be introduced periodically to already existing groups (Kanas, 1985; Yalom, 1983). At this point however it should be noted that the participation of patients in such groups is not always voluntary or autonomous as these group interventions are held in the context of a therapeutic whole following patients’ hospitalization. On the contrary, group-based interventions in outpatient settings usually do not use any exclusion or formation criteria as every patient suffering from psychosis who has the will to participate in such programs can be accepted, except perhaps the maximum number of members attending each group (Aiello & Ahmad, 2014; de Chavez, 2009). Group therapeutic factors are considered to be specific action mechanisms, inherent to the dynamics being developed in a group and to the processes of group members’ interaction, that are considered to play a key role in facilitating therapeutic change in each group member. According to Yalom and Leszcz (2005), these factors are grouped into 11 categories, namely: the instillation of hope, universality, imparting information, altruism, re-enactment of the primary family group, development of socializing techniques, imitative behavior, interpersonal learning, group cohesiveness, catharsis, and existential learning. With respect to group psychotherapeutic interventions for psychosis, a number of studies have addressed the relative importance of the aforementioned factors in their contribution to therapeutic process and change. García-Cabeza and colleagues (2011) presented the outcomes of a series of studies utilizing the Yalom questionnaire (Yalom, 1985) and examining the importance of these factors according to the perspective of patients suffering from psychosis and participating in inpatient and outpatient psychotherapeutic groups. Instillation of hope was the factor with the highest rank among psychotic patients in outpatient and inpatient settings, while for patients who experience long-term group treatment in outpatient settings and with greater capacity for insight, the importance of this factor was somewhat lessened with self-understanding receiving almost equal importance. Other factors of importance were for inpatients the group cohesiveness, altruism, and interpersonal learning, while for outpatients universality and interpersonal learning constituted significant therapeutic factors. In a later study by Restek-Petrović and colleagues (2014), instillation of hope was again the factor with the highest perceived importance, alongside with group cohesiveness and existential factors, among patients in a group with psychodynamic approach. Moreover, it was found that there was a positive relationship between patients’ length of duration of their participation in the group with higher levels of perceived importance of the catharsis and family re-enactment factors. Finally, based on the experiences of patients-members of outpatient (conducted in community day centers) groups of various therapeutic modalities for psychosis, patients’ cognitive improvement, the making of social and friendly relationships and the sharing of emotions and experiences with other group members, as well as the increased self-knowledge via group learning processes appeared to be curative factors associated with greater group therapy efficiency and positive outcome, while difficulties experienced by group members for open expression were identified as factors that hinder the therapeutic process (Caruso et al., 2013). Overall, it has been suggested that the more supportive facets of group therapeutic factors such as universality, members’ acceptance, and instillation of hope tend to play a key therapeutic role during the first stages of a group, as well as for short-term groups in inpatient settings. However, these factors continue to be of importance for outpatient, long-term groups throughout the whole therapeutic endeavor as these factors facilitate and support the working alliance among therapists and group members, promote a sense of self-acceptance and self-awareness, while they enhance members’ motivation for involvement in the treatment and for creating expectations for improvement with further positive outcomes for patients’ self-esteem and for diminishing their sense of demoralization (de Chavez, 2009). Group therapeutic factors are assumed to operate as curative or change-facilitating factors trans-diagnostically, irrespective in a sense from the kind of psychotherapeutic interventions implemented in a therapeutic group. Adjunctive to the operation of the group therapeutic factors comes the contribution of the therapist’s role in maintaining this operation in motion with the greatest possible effectiveness (Yalom, 1985). In the operation of psychotherapeutic groups for psychosis, therapist’s role apart from being responsible for the creation and maintenance of the group, for the building of a group culture, and for activating and illuminating here-and-now group processes (Yalom, 1985), also has some specific peculiarities deriving from the very nature of the psychosis, peculiarities that can additionally vary according to the setting (inpatient vs outpatient group settings) and to the level of group members’ functionality. More specifically, and given that higher levels of anxiety can be experienced among psychotically disturbed group members as well as that group members suffering from psychosis may exhibit various degrees of impairments in reality testing capacities, therapists need to maintain a consistent, active, supportive, and open stance as such attitudes can reduce experienced anxiety and facilitate members’ reality testing both in inpatient and outpatient settings (Kanas, 1985, 1991; Urlic, 2010). Especially, for inpatients settings dealing mostly with the acute phases of psychotic manifestations, therapists’ active and supportive role becomes much more prominent (kanas, 1985). The therapists must also cultivate feelings of safety among group members, facilitate strong feelings of cohesion and elaborate on the creation of a strong therapeutic alliance among therapists and group members a priori to any kind of interventions implemented, while such preparatory processes may take longer compared with groups with non-psychotic members (Lecomte, Leclerc, Wykes, Nicole, & Baki, 2015). In parallel, therapists should encourage group members’ interactions and facilitate members to relate to the here-and-now, with any positive psychotic manifestations such as delusions and hallucinations to be openly discussed in terms of the meaning and relevance that such manifestations may entail for any group member. In the same line, expression of emotions is highly encouraged, particularly for group members with negative symptoms, while in either case (inpatient or outpatient settings) the role of therapists in providing structure and advice when needed is highly recommended (Kanas, 1985; McQuaid, 2008). Finally, depending of the presence of the psychotic symptoms and of the degree of cognitive impairments and of the functionality of group members, therapists’ interventions can lay alongside a continuum from more supportive to more exploratory interventions (Lakeman, 2006). As such, when among group members there is a high degree of active psychotic symptoms and/or cognitive impairments therapists’ physical presence and capacity for containing patients’ overwhelming feelings of anxiety is crucial. Accordingly, with lower levels of members’ functionality, therapists are more encouraged to demonstrate empathic communication through support, affection, and acceptance of patients’ state, to provide reassurance, guidance, and advice, while communicating in parallel a hopeful attitude and providing emphasis on collaborative working toward patients’ development of coping skills (de Chavez, 2009; Lakeman, 2006). On the other hand, with group members showing higher levels of functionality and engagement in the therapeutic process, therapists’ role can transform from being that of an active leadership and containment of the group, to a more conducting role following group’s lead and initiatives (Ulric, 2010). With higher functionality, more insight oriented psychotherapeutic approaches can be implemented accordingly (Lakeman, 2006). Finally, therapists’ role is dictated also by the high possibility of frequent relapses of group members, especially in times of heightened anxiety (O’Connor, 1991), further pointing out the need from therapists to be flexible in adjusting their psychotherapeutic approach the group members’ psychological states. Closely tied with issues of group members’ levels of psychotic symptoms, cognitive impairments, and general level of functionality is the content of transference that can emerge in a group. From the perspective that psychotic episodes essentially constitute an identity breakdown manifested in splitting processes that fragment one’s sense of continuity and internal structure, and in processes of cognitive regression, recovery from psychosis can be an inverse process to the evolution of an integrated identity including the psychotic experience (de Chavez, 2009). Accordingly, it has been suggested that transference in the therapeutic relationship between therapists and group members suffering from psychosis can follow a parallel road with members’ evolution of an integrated identity. As such, group psychotic transference can develop from the initial contact with the therapists and with the overall group entity, a contact that may not exist as such but to be a part of patients’ symbiotic psychotic world. However, as therapy proceeds, psychotic transference can gradually transform from a primitive, unstable and ambivalent relationship, to a more stable, personal relationship characterized by safety and respect, reaching to a strong therapeutic relationship (de Chavez, 2009). In this process, patients’ transference can be assumed to emerge and vary in three levels or dimensions, often at the same time: (a) a pragmatic or rational transference deriving from the healthy part of the patient who experience the other as a separate individual with separate personal qualities, (b) a neurotic transference, where however transferential distortions have an “as if” quality rather than being concrete, and (c) a psychotic transference with concrete distortions in perceptions of others (Martindale & Summers, 2013). Subsequently these tranferential reactions can lead to intense feelings of countertransference such as feelings of frustration, boredom, and detachment that may negatively interfere with therapists’ role and interventions, further pointing out the essential need for therapists’ teamwork and supervision (Martindale & Summers, 2013; Horowitz, 2002; Ulric, 2010). Given the increased interest in group psychotherapeutic interventions for psychosis, particularly after the deinstitutionalization movement since 1970, currently there is a plethora in the development and provision of group psychotherapeutic modalities for psychosis, originating from various therapeutic approaches (Caruso et al., 2013;; Orfanos et al., 2015), most of which constellate around cognitive-behavioral, psychoeducational, social and coping skills training, expressive-art therapy, as well as psychodynamic orientations (Lorentzen, & Ruud, 2014; Rosenbaum, Martindale, & Summers, 2013). In the following paragraphs a brief presentation for two of the main group psychotherapeutic orientations for psychosis is attempted, namely psychodynamic and cognitive-behavioral approaches. Cognitive-behavioral therapy for psychosis was initially developed as a structured, manualized treatment for addressing psychotic symptoms. From a CBT perspective, psychotic symptoms such as delusional thoughts are viewed as the product of impaired cognitive processes that characterize the psychotic individual and limit his or her ability to challenge or question such thoughts. Subsequently, the main goals of CBT interventions for psychosis are (a) to facilitate the identification and establishment of associations among patient’s thoughts, feelings, and behaviors with regards to symptoms and functioning, and (b) to enhance patient’s ability to re-evaluate his/her reasoning, perceptions, and/or beliefs relating to symptoms, and accordingly to develop alternative and more reality-based beliefs, explanations, and cognitive processes. As a byproduct of these goals, therapeutic interventions aim at enhancing patients’ capacity to monitor their behaviors, feelings, and cognitions with respect to their symptoms, at promoting their ability to find more adaptive and reality-based ways of coping with their symptoms, and generally to reduce patients’ feelings of distress and improve their functioning (National Institute for Health and Clinical Excellence, 2009). Group CBT for psychosis, is manualized and highly structured, while the number of sessions can range from 4 (in its shortest form employed in inpatient settings; for example see Owen, Sellwood, Kan, Murray, & Sarsam, 2015) to 24, once a week or bi-weekly, depending on the setting and on the specific therapeutic goals. Also, the duration of each session can last from 60 to 120 minutes (Barrowclough et al., 2006; Lawrence, Bradshaw, & Mairs, 2006; Lecomte et al., 2015). Despite differences in the length and duration of sessions, group CBT interventions adhere to a specific protocol format that includes components such as psychoeducation about psychosis, medication adherence and side-effects, linking thoughts, emotions, and symptomatic behaviors, reappraisal and modification of distressing thoughts and maladaptive symptomatic behaviors, improving self-esteem, enhancing coping skills and symptoms management. To this end CBT techniques may be used (Socratic questioning, looking-for-evidence techniques, findings alternatives or more balanced thoughts and beliefs, behavioral experiments, etc.) adjusted to the needs and cognitive capacities of the patients (Lawrence, Bradshaw, & Mairs, 2006; Lecomte et al., 2015). Of great importance to all models of Group CBT (except perhaps very short-term models employed in inpatient settings) is the building of trust, safety, group cohesion, and working alliance among group members and therapists, a process that may take up to a month (Lecomte et al., 2015; McQuaid, 2008). Other group interventions based on a cognitive-behavioral approach are: (a) short-term group psychoeducational programs, including up to 8 sessions of 60 to 90 minutes duration, and focusing on specific topics such as psychotic symptoms, medication’s effects and side effects, medication adherence, early monitoring of symptoms of relapse and relapse prevention (Bechdolf et al., 2010); (b) Social Skills Training CBT Groups, aiming at enhancing patients’ social functioning via behavioral interventions and by training patients in understanding and responding adaptively in social cues, in assertive verbal communication, in active listening, and in the engagement in problem solving activities and in living skills. Sessions are held weekly for one or two hour duration, and up to 6 months (Granholm et al., 2005); (c) Integrative approaches combining group CBT and social skills interventions (e.g. Cognitive-Behavioral Social Skills Training – CBSST; McQuaid, 2008). Group CBT for psychosis has been shown to be effective in reducing feelings of hopelessness and of low self-esteem (Barrowclough et al., 2006), social anxiety and feelings of depression, and to have a positive contribution to lower relapse rates and rates of re-hospitalization (Lawrence et al., 2006). However, regarding the reduction of psychotic symptoms findings were inconsistent (Lawrence et al., 2006), while therapeutic alliance and group cohesion were factors that were strongly linked with positive outcomes (Lecomte et al., 2015). From a psychodynamic perspective, psychosis can be viewed as a person’s response to unbearable affects and situations, and generally to unbearable aspects of internal and external reality that exceed a person’s capacity for coping with them in a non-psychotic, reality-based way. This response can be the outcome of the interaction of an individual’s negative, traumatic, or abusive early attachment relationships, of the impact of life stressors, and of person’s vulnerability to psychosis depending on his or her constitutional and biological makeup (Martindale & Summers, 2013; Rosenbaum et al., 2013). From this perspective, psychodynamic group psychotherapy for psychosis focus on patients’ attachment needs, on the therapeutic relationships among patients and therapists, on patients’ capacity for mentalizing – that is, patients’ metacognitive abilities to reflect on their own and others internal experiences -, and on facilitating patients’ capacities for personal and interpersonal problem solving and for developing their self-agency (Rosenbaum et al., 2013). Psychotic symptoms from a psychodynamic perspective are sought to reflect a specific meaning for the patient and as such attempts are made from the therapists to contain patients’ manifestations of psychotic symptoms by elucidating their hidden meanings. In parallel, issues of group transference and therapists’ countertransference are taken into consideration in this process of symptoms’ meaning making (Martindale & Summers, 2013). Psychodynamic group interventions can be manualized (Rosenbaum et al., 2005) or not (e.g. Aiello & Ahmad, 2014; Gabrovšek, 2009; Ulric, 2010), while therapy in outpatient settings can be long-term or open-ended. Interventions can be thought to lay on a continuum from more supportive and empathic to more expressive depending on members’ levels of general functioning and of cognitive abilities, having always in mind to engage and enhance patients’ healthy aspect of self while accepting and containing patients’ vulnerability (Lakeman, 2006; Rosenbaum et al., 2013; Ulric, 2010). Generally, therapists’ interventions aim at aiding patients making more realistic connections between experiences and events in their life, at helping them understand past and present emotions and at expressing them, as well as facilitating them in finding a personal meaning for their symptoms. Also, therapists’ role is to stimulate and enhance patients’ empathic capacity and interest for others, by encouraging interactions among group members and personal reflections on them. Finally, therapists are needed to provide information about the purpose and structure of therapy (although topics and themes discussed usually come from group members and not by therapists as accustomed in CBT approaches), about medication, as well as to address possible elements of self-destructive behaviors and factors that may hinder patients’ progress (Aiello & Ahmad, 2014; Rosenbaum et al., 2013; Ulric, 2010). Longitudinal evidence from the Danish National Schizophrenia Project (Rosenbaum et al., 2005) suggest that psychodynamic oriented group interventions can have positive effect on reducing psychotic symptoms and on elevating patients’ level of functionality. Also, according to the National Institute for Health and Clinical Excellence (2009) guidelines, psychodynamic principles were suggested to be utilized in order for therapists and clinicians to obtain a more broad understanding of patients’ experiences, symptoms, and interpersonal relationships. Results from a recent meta-analytic study showed that group psychotherapy for psychosis produces significantly positive outcomes, especially in reducing negative psychotic symptoms and in improving the social functioning of people who suffer from disorders in the psychotic spectrum. Moreover, these results appeared to exist trans-diagnostically, irrespective of the therapeutic approach implemented (Orfanos et al., 2015). Also, results from the Danish National Schizophrenia Project (Rosenbaum et al., 2005) pointed out that an integrative form of interventions (including elements of supportive therapy, assertive communication treatment, psychoeducation, multifamily treatment, social skills training, and medication) provided in a group format had the greatest positive long-term outcome, compared with supportive psychodynamic therapy and treatment as usual. Taking into consideration the results of these two studies, alongside with the tendency for psychotherapeutic services to be provided in a more integrated form, further giving valence to common therapeutic factors (Wampold, 2001), perhaps a group psychotherapeutic approach for psychosis that combines successful elements from current CBT and psychodynamic interventions, can prove to be more effective and efficacious in terms of providing holistic treatment services to patients functioning in the psychotic spectrum. For example, in both therapeutic approaches, the establishment of safety and of a strong therapeutic alliance between therapists and patients/group members appears to be a significant factor related with group’s cohesion and with positive therapeutic outcomes at the far end (Lecomte et al., 2015; Rosenbaum et al., 2013). Moreover, cognitive social skills training, psychoeducation, and elements from supportive psychodynamic psychotherapy have shown to produce favorable outcomes with regards to patients’ improvement in psychosocial functioning, in alleviating experienced distress and feelings of hopelessness and depression, in enhancing patients’ self-esteem, and in increasing patients’ capacity for reflection and for integration of their feelings and narratives (Barrowclough et al., 2006; Rosenbaum et al., 2005; Lawrence et al., 2006). Given the fact that since the emergence of the deinstitutionalization movement the role of the therapeutic communities has significantly increased in the provision of psychosocial services to people suffering from psychosis, it remains for future research to explore the feasibility in terms of cost-effectiveness and treatment’s efficacy in providing such integrative group treatment packages. Bion, W. R. (1974). Experiences in groups-and other papers. Oxford, England: Ballantine. Bion, W. R. (1957). Differentiation of the psychotic from non-psychotic personalities. The International Journal Of Psychoanalysis, 38266-275. Foulkes SH, Anthony EJ (1957) Group Psychotherapy: The Psychoanalytic Approach. Karnac Books. Gabrovšek, V., P. (2009). Inpatient Group Therapy of Patients with Schizophrenia. Psychiatria Danubina, 21 (1), 67-72. González de Chávez, M. (2009). Group psychotherapy and schizophrenia. In Y. O. Alanen, M. González de Chávez, A. S. Silver, B. Martindale, Y. O. Alanen, M. González de Chávez, ... B. Martindale (Eds.) , Psychotherapeutic approaches to schizophrenic psychoses: Past, present and future (pp. 251-266). New York, NY, US: Routledge/Taylor & Francis Group. González de Chávez, M., Guttierrez, M., Ducaju, M., & Fraile, J. C. (2000). Comparative Study of the Therapeutic Factors of Group Therapy in Schizophrenic Inpatients and Outpatients. Group Analysis, 33(2), 251. Horowitz, R. (2002). Psychotherapy and Schizophrenia: The Mirror of Countertransference. Clinical Social Work Journal, 30(3), 235-244. Kanas, N. (1985). Inpatient and Outpatient Group Therapy for Schizophrenic Patients. American Journal Of Psychotherapy, 39(3), 431. Kanas, N. (1991). Group therapy with schizophrenic patients: A short term homogeneous approach. International Journal of Group Psychotherapy,4, 3347. Lazell, E. W. (1930). The group psychic treatment of dementia praecox by lectures in mental reeducation. US Veterans Bureau Medical Bulletin, 6733-747. McQuaid, J. R. (2008). Group therapy. In K. T. Mueser, D. V. Jeste, K. T. Mueser, D. V. Jeste (Eds.) , Clinical handbook of schizophrenia (pp. 279-286). New York, NY, US: Guilford Press. National Institute for Health and Clinical Excellence (2009). Schizophrenia: Core Interventions in the Treatment and Management of Schizophrenia in Adults in Primary and Secondary Care (Updated Edition). British Psychological Society/Royal College of Psychiatrists. O'Connor, F. W. (1991). Symptom monitoring for relapse prevention in schizophrenia. Archives of Psychiatric Nursing, 5(4), 193-201. Urlić, I. (2010). The Group Psychodynamic Psychotherapy Approach to Patients with Psychosis. Psychiatria Danubina, 22 (1), 10-14. Wampold, B. E. (2001). The great psychotherapy debate: Models, methods, and findings. Mahwah, NJ, US: Lawrence Erlbaum Associates Publishers. Yalom, I. D. (1983). Inpatient group psychotherapy. New York, NY, US: Basic Books. Yalom, I. D., & Leszcz, M. (2005). The theory and practice of group psychotherapy (5th ed.). New York, NY, US: Basic Books.